Highveld Stereo Live Streaming Online . 947 (formerly 94.7 Highveld Stereo) is a radio station that broadcasts on the 94.7 FM frequency from Johannesburg, Gauteng, South Africa. If you think Joburg, you think 947. From the towering skyscrapers of Sandton, to the dusty mine dumps, 947 broadcasts the heart beat of the city. On 1 September 2014 the station decided to drop the logo that they have been using for over a decade. 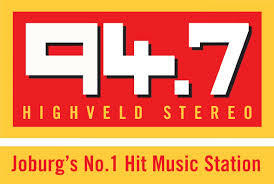 The station is also no longer known as Highveld Stereo as the name changed to being just 947. Postal Address : PO Box 3438 , Rivonia, South Africa 2128. Physical Address : Primedia Place, 5 Gwen Lane, Cnr. Gwen Lane and Fredman Drive, Sandown, Gauteng .